The journal was founded in 1946, is published in Russian, is registered with the Russian Scientific Citation Index (RSCI) bibliographic database, has the International Standard Serial Number ISSN 2411-1902 and has the Mass Media Registration Certificate "ПИ № ФС77-66921 / 22.08.2016". 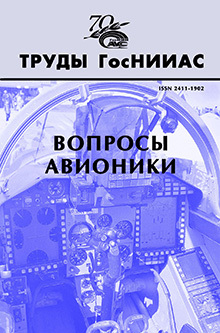 The journal publishes academic papers, scientific reviews and research results presented by researchers of GosNIIAS and cooperating enterprises in the fields of manned and unmanned aircraft concept definition, airborne computer design technologies, airborne weapon delivery algorithms, avionics systems, aircraft control algorithms, software certification, air traffic control, etc. The journal is dedicated for avionics designers, students and postgraduates of respective specialties. Journal publisher: FGUP GosNIIAS Editorial and Publishing Department. Publication frequency – at least 4 issues yearly. Editorial and Publishing department address: Victorenko str., 7, Moscow 125319. Tel. : +7 (499) 157-91-13, +7 (499) 157-91-63; e-mail: infocenter@gosniias.ru.